The Uncanny X-Men No. 266 - 1st Gambit - KEY - 1990. Shipped with USPS Priority Mail. In excellent shape. Shows a a couple of places where it was touched by a hand to look at . Has been stored away for many years . Please see pictures for details. As is sale. Check out all my other sales!!!! You're bidding on Uncanny X-Men #266 cgc 9.4 1st App. Gambit (Marvel). Brand new casing, perfect condition. If you have any questions please contact me before bidding. Shipped with USPS Priority Mail. Uncanny X-men #266 - 1st Appearance of Gambit - Sharp Copy - 9.2 Near Mint-. 1st Full App. Of Gambit. MARVEL COMICS. FIRST FULL APPEARANCE of GAMBIT. Mystique appearance. Andy Kubert cover. Chris Claremont writer. It takes one minute to fill out the form and will ensure 100% accuracy for your order. New ListingThe Uncanny X-Men #266 First Appearance of Gambit! High Grade! Key Comic! The Uncanny X-Men #266 First Appearance of Gambit! High Grade! Get your hands on the first full appearance of everyone's favorite ragin' Cajun! Key High grade and ready for you if you throw a bid card down! 4.5 out of 5 stars - The Uncanny X-Men #266 First Appearance of Gambit! High Grade! Key Comic! 30 product ratings30 product ratings - The Uncanny X-Men #266 First Appearance of Gambit! High Grade! Key Comic! #266 (1st Gambit). #350 (Trial of Gambit). #244 (1st Jubilee). #184 (1st Forge). #201 (1st Cable). There will be no lift gate unless requested and paid for by the recipient. #164 (1st Binary). #172 (1st Solo Wolverine). This will SAVE YOU MONEY! It speaks for itself! We strive for 5-Star service. We take our reputation seriously. The Uncanny X-Men #266 (Aug 1990, Marvel). The first appearance of Gambit. This is from my personal collection. It has been sealed and backed since purchased. Shipped securely with USPS First Class Package. The Uncanny X-Men -266 1st appearance of gambit. Key issue. SO SO GOOD! It contains 36 printed pages. This English comic features the main characters Ororo, Mystique, Gambit, Val Cooper, and the Orphan-Maker. You will receive book in pictures We do combine shipping for domestic orders, unfortunately we can not apply Combine Shipping to international orders. Flat rate shipping fee of 4.99 for unlimited number comic books. CGC Graded books flat rate fee of 13.00. If you add books to cart and shipping discount doesn't change please email us and will fix it. Be sure to save/follow us. We add new books daily. Uncanny X-Men #266 CGC 9.2 1st Appearance Gambit. Shipped with USPS Priority Mail. UNCANNY X-MEN # 266 1st FULL APPEARANCE GAMBIT MIKE COLLINS Marvel COMIC BOOK . Shipped with USPS Priority Mail. Uncanny x-men#266 (The first appearance of Gambit). Shipped with USPS First Class Package. Certification number: 2009097013. First full cover/appearance of Gambit. CGC 9.8 NM/M Off White/White pages. Comics #145 & up are Mostly VF & Better. Comics are Complete unless otherwise noted. 135 is FN 6.5. 221 is VF 8.0. The Uncanny X-Men #266 (Aug 1990, Marvel) 🗝️ CGC 9.4. 1st App. of Gambit! The Uncanny X-Men #266 (Aug 1990, Marvel) CGC 9.4. KEY Issue. 1st App. of Gambit!. * All comics are kept sealed in climate controlled room * Shipped with USPS Priority Mail. 4.5 out of 5 stars - The Uncanny X-Men #266 (Aug 1990, Marvel) 🗝️ CGC 9.4. 1st App. of Gambit! 30 product ratings30 product ratings - The Uncanny X-Men #266 (Aug 1990, Marvel) 🗝️ CGC 9.4. 1st App. of Gambit! 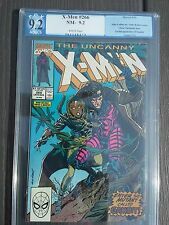 Uncanny X-men #266 - CGC - 9.2 Signed by Andy Kupert - 1st appearance of Gambit. Item will be shipped safe and secure with USPS Priority Mail. Perfect Case Fresh from CGC. Very satisfied with everything excell. The Uncanny X-Men #266 (Aug 1990, Marvel) 1st Appearance GAMBIT 🔥movie coming! 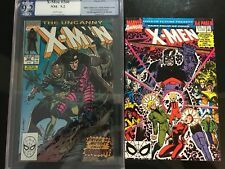 The Uncanny X-Men #266 (Aug 1990, Marvel) 1st Appearance GAMBIT movie coming!. Very nice color, ? Higher grade with a press! Shipped with USPS First Class Package. 4.5 out of 5 stars - The Uncanny X-Men #266 (Aug 1990, Marvel) 1st Appearance GAMBIT 🔥movie coming! 30 product ratings30 product ratings - The Uncanny X-Men #266 (Aug 1990, Marvel) 1st Appearance GAMBIT 🔥movie coming! 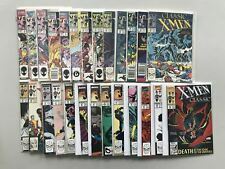 X-Men #266 French Edition Euro Variant 1st Gambit Key Incl #264 #265 Rare. Foreign print run were much smaller than USA comics. Use pictures to judge condition. 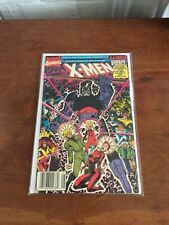 The Uncanny X-Men #266 (Aug 1990, Marvel) First Gambit Appearance, NM-M. Shipped with USPS Priority Mail. This book is professionally graded by the CGC. This comic has a grade of 9.2 and has WHITEPAGES. We recently obtained a large collection of comics! Marvel uncanny x-men #266 great condition comes in plastic sleeve mailed in bubble envelope. However, we understand there could be people even more strict than us out there and we also humbly realize that we are human. You may be pleasantly surprised just how far we will go to make you happy. We are not comic graders, but if you are looking for a great issue at a great price, then this is for you. The photos are of the actual item you will receive. I am a collector and value the condition you receive your item in as much as you do. UNCANNY X-MEN 266 VF/8.0 - 1st appearance of Gambit! 1st appearance of Gambit. Light indentations to edges of cover. 1st appearance of Gambit! This is a HOT book and will only continue to go up in value. Case and book are in excellent condition. Double Signed by Chris Claremont, once in silver and once in black. everything goes out priority. 1st Gambit Appearance. The pictures are of the book you will be purchasing. 1st full appearance of Gambit. Mystique appearance. CGC Graded 9.6 ~ WHITE PAGES! Scans have been provided for a visual condition of this item. CGC GRADED 9.6. (1990) MARVEL COMICS. NO EXCEPTIONS. The Uncanny X-Men #266 Marvel Comics August 1990 1st app of Gambit! VF 8.0! 🔥UNCANNY X-MEN #266 CGC 9.6**(AUG 1990, MARVEL)**1ST APP OF GAMBIT**KEY**MOVIE!